The origins of many street and road names in Ammanford are obvious enough to need no explanation. Walk along Church Street and you'll soon come to a church. Likewise you'd expect to find a railway station on Station Road and you won't be disappointed. Llandybie Road leads, not surprisingly, to Llandybie while Pantyffynnon can be found quite easily at the end of Pantyffynnon Road. Roads that carry the name of a person would be expected to be named after someone  but who? The great and the the good of the locality usually, as not many ordinary people, if any, get a road named after them (for great and good, read wealthy). So who was the Arthur of Arthur Street? Will the Margaret of Margaret Street come forward and be identified? Was Florence Road named after Florence Nightingale or someone closer to home, and who was the Colonel of Colonel Road, Betws? These and other questions can now be answered, thanks to the extensive research of W.T.H. Locksmith and his book, Ammanford: Origins of Street Names and Notable Historical Records, published by Carmarthenshire County Council in 2000. Until fairly recently, the privilege of naming a street was given to the owners of the land upon which the houses were built and they usually used the opportunity to immortalize their family by naming a street after their wife, children, an ancestor or even themselves. Seven Sisters in the nearby Dulais valley is an extreme example of this, the entire village being named after the seven sisters of the mine owner who built its wretched terraces to house his workers. Streets are named after some of these sisters as well, just in case anyone forgets who they were. These days it is usually the property developer who chooses street names for any new housing development, subject to the approval of the local council. This could be the local authority themselves, as in the case of council estates, or a property developer, as in the case of private housing complexes. Until the mid-nineteenth century the land of Ammanford and the surrounding district was owned by a relatively small number of families, some belonging to the aristocracy such as the Lords Dynevor and Cawdor, some belonging to the lesser gentry, and some to more recent, 'self-made' families. Their income came mainly from agriculture and rent from their tenant farmers, but increasing industrialization brought a new source of income from the mines, factories, shops and services and, relevant to our story, from property development. As the coal reserves were exploited, house-building grew to provide homes and services for the influx of people into the area. The landowners either sold off land to the property developers who built the houses, factories, shops and churches needed for a growing town, or some even turned property developer themselves. Here, with acknowledgment to W. T. H. Locksmith, are the histories of the older streets which have been named after people. As you travel from Ammanford towards Llandybie, at Bonllwyn you go over a short hill, known as Brynmarlais Hill, with two large houses on the right hand side of the hill. One, Brynmarlais House, is visible from the road and next to it, hidden behind trees, is Green Shutters. Both were originally owned by the Herbert family of Bonllwyn, only passing out of the family in the mid-1990s. Henry Herbert, Mining Engineer, was the senior partner in his own business of H. Herbert & Co, Mining Engineers and Surveyors, with an office in College Street. In 1890 Mr. Herbert acquired the land and farm of Myddynfych estate, the farm being the oldest-known building in the area. (Maenor Myddynfych is mentioned in the Book of Chad, written about 800 AD.) Myddynfych farm is still occupied to this day, though in a much sorrier condition that even twenty years ago. Even though it is now a listed building there is concern that such a historic farmhouse may not survive its recent years of neglect for much longer. The Herbert family were earlier pioneers of Ammanford, marrying into another family who also made a major impact on the town which lasts to this day  the Evans family of 'Evans the Chemist', fame. Evan Evans built most of today's Ammanford Square along with the arcade  click HERE to see a photograph of Evan Evans and his creation. John Herbert of Cathilas had four children  Annie, Henry, Herbert and William. Annie married Evan Evans, chemist, and her brother Herbert became a doctor in London. William emigrated to New Zealand and as a youth was engaged in lumbering. He returned to Ammanford in 1888 where he created the Baltic Sawmills business and was a founder of Ammanford's Plymouth Brethren Church, the Gospel Hall. (Click HERE for a biography of William Herbert written by local Methodist minister Nantlais). His two daughters Gladys and Irene became medical practitioners. Henry Herbert of Brynmarlais was a surveyor and engineer and a pioneer of the coal industry in the valley. It was Henry Herbert who sank the first mines in the locality, first at Bodyst on the Betws Mountain above Hopkinstown followed by what was to become Ammanford No 1 Colliery in Betws (the site of today's Betws New Drift mine). In 1911 some of Henry Herbert's land in Tirydail was leased for building plots and named Arthur Street, after Henry Herbert's son, Arthur David Herbert (born 1903, died 1973). In 1949 the rest of the field was purchased from the Herbert family by Ammanford Urban District Council to build a new council estate, named Myddynfych after the name of the farm. Part of Arthur Street then became incorporated into the council estate of Myddynfych. This group of roads was built on land owned by Lord Dynevor, or the 6th Baron Dynevor, Arthur De Cardonnel Fitz Uryan Rhys, to give him his full, if somewhat Ruritanian title. The 6th Baron had a son and heir named Walter Fitz Uryan Rhys after whom WALTER ROAD was named. In 1898 Walter married the eldest daughter of the 7th Earl of Jersey, one Lady Margaret Child-Villiers, giving her name in turn to MARGARET STREET. But matters didn't stop there, as the road connecting Walter Road to Margaret Street, originally known as Llwyn-Onn Road after a house of that name, was renamed UNION STREET to commemorate the marriage of the two. The Welsh translation given to the street by the local council, Stryd yr Undeb, is a literally correct translation (Undeb means Union in Welsh) but, as Mr Locksmith points out, perhaps Stryd y Priodas (Marriage Street) would be more accurate. More was to come when two fields of Parc-y Rhun farm were also developed for housing and named VILLIERS ROAD after the Lady Margaret Child-Villiers in question. Another road was developed next to Villiers Road and named BISHOP ROAD after Lord Dynevor's land agents, who had consisted of three generations of a family named Bishop. At the time Bishop Road was built Lewis Bishop was the agent. He was succeeded after his death by his son Major John (Jack) Walton Bishop who held this appointment until his retirement in the late 1960s. Not far away from Bishop Road, just across the modern recreation ground  also once owned by Lord Dynevor  lay another parcel of land which was sold off by the 6th Baron Dynevor. This he named TALBOT ROAD after an ancestral connection going back to the marriage of George Rice in 1756 to the only daughter and heir of William, Earl Talbot. At this point however the Dynevor peerage had not yet been conferred on the Rice family who now held the surname Talbot by marriage. Then, in 1817, George Talbot, by now the third Baron Dynevor, reverted the title to the original family name of Rice. The peerage had been created in 1780  see 'The Dynevor Family Line' below. This road, part private, part council housing, was originally a field owned by the 6th Lord Dynevor, Arthur De Cardonel Rice, (24th Jan 1836 - 16th Dec 1889). W. T. H. Locksmith in his book on Ammanford street names conjectures that it was he who probably gave the original street its name, after a 15th century ancestor, Gruffydd ap Nicholas, who called himself Lord Is-Cennen. The name Iscennen (also spelled Iskennen) had been around far longer than this, however. The early history of the Dynevor dynasty (ie pre-12th century) is mostly based on conjecture and legend, there being no written records to confirm whatever the imagination has embroidered on time's blank spaces. The legendary part of the Dynevor ancestry claims a 6th century origin in Uryan Rheged, Lord of Kidwelly, Carunllou, and Iskennen in South Wales. He supposedly married Margaret La Faye, daughter of Gerlois, Duke of Cornwall, and is even credited with building the castle of Carreg Cennen in Carmarthenshire. He had originally been a prince of the North Britons (ie Scots), but was expelled by the Saxons in the 6th century and fled to Wales. And if that's not enough, Uryan Rheged's great-great-grandfather is claimed to have been Coel Codevog, King of the Britons. Coel, who lived in the 3rd century A.D., seems to be the original of the nursery song, 'Old King Cole.' (See The Annotated Mother Goose, William S. and Cecil Baring-Gould, Clarkson N. Potter, 1962.) Well maybe; or then again, maybe not. "The Rices (later Rhyses) have in their time claimed descent from URIEN RHEGED, ruler of an area called Rheged on the English-Scottish borders in the late 6th century. But the known chronology does not fit. Indeed the descent may be from a much later Urien." Burke's Peerage goes on to list the earliest known ancestor of the family as being one Einon ap Llywarch, born circa 1150. But what is beyond conjecture or legend is that modern Iscennen derives from the medieval commote of Iskennen, roughly equal in extent to the area between the Towy and Amman rivers. Is-Cennen comes from "Is" = lower and 'Cennen', the river flowing into the Towy at Llandeilo; therefore the name means 'below the river Cennen', (ie south of Llandeilo). The administrative  and militiary  centre was the impregnable Carreg Cennen castle, built on a limestone outcrop three hundred feet above the river Cennen. A Commote was a division of land for administrative purposes. There were usually 50 trefydd (towns) in each commote, and two or three Commotes normally made up a Cantref ('cant' = a hundred and 'tref' = town). A Cantref is approximately equivalent to a modern Borough. The Commote was further divided into twelve manors of four trefi each, making 48 trefydd in all and with the two extra trefydd or towns being the property of the king. Many modern parishes have roughly the same boundaries as these medieval manors, including today's parish of Llandybie, which is still a pretty good fit for the thousand-year old manor of Myddynfych. The modern Welsh word 'tref' is usually translated as 'town' but towns in the Middle Ages were far smaller affairs than their modern counterparts, and were basically small settlements of a few homesteads and farms. Two or three Cantrefs usually made up the equivalent of a modern Shire County. 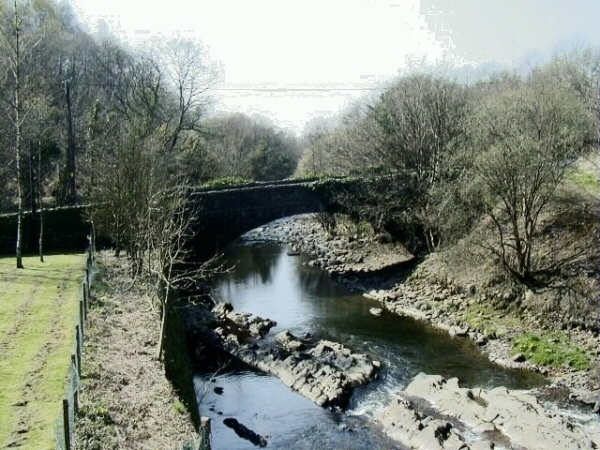 The Amman Valley is situated in the Commote of Iskennen of the Cantref Bychan. Had there been postal addresses in those days Ammanford would probably have read something like this: Manor of Myddynfych, (Parish of Llandybie), Commote of Iskennen (Borough of Dinewfr), Cantref Bychan (Carmartheshire), Kingdom of Deheubarth (Dyfed). The Dynevor family seems to run like a thread though the history of Ammanford's street and house building, not surprisingly, as they owned most of the land in the area. The name Rice would, on first examination, appear to have nothing to do with the Dynevors. But closer inspection reveals the Rice and Dynevor families to be one and the same. The connection goes back to the 16th century when the family who resided at Dinefwr Castle, Llandeilo, acquired the English name of Rice  see 'The Dynevor Family Line' below. "I remarked upon this at a St. David's Day function here in Ammanford recently. Someone got to his feet and harshly condemned me, adding that I had no grounds what so ever for making such remarks. The following morning, I stood by the school gate and listened to the teachers and the gentleman concerned chattering in the yard. Not a single word of Welsh was heard. And if I may say so, I found it highly amusing when I heard the wives of some of our foremost Welsh preachers, at the meetings of the union of Welsh Independents here last summer. Some of these ladies believe that speaking English is indispensable to their class. This is the only way they can show that they belong to the elite. Poor, insecure little things! But keep your ears open in the shops and on the streets and even in the lobbies of our chapels and you'll hear the swankiest English ever created and such English! Indeed, I have heard better English spoken by the tribesmen of the Karoo [in South Africa]." In 1916, the 7th Baron Dynevor, Walter Fitz Uryan Rice, re-assumed the name of Rhys by Royal license for himself and his issue, but not before another street, this time in Betws, was built in 1906. This was, as usual, named by the 7th Baron Dynevor, the family name then still being Rice. 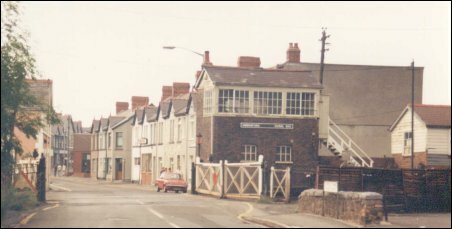 Rice Street is one of the entrances to Ammanford Town football club, which was once known as Betws football club until it too changed its name in the 1960s. They all seem to be at it. Fashions, in names as in everything else, change at a bewildering rate. When the old Ammanford Urban District Council was abolished in 1974 and merged with other local councils to form a new Borough Council with its headquarters in Llandeilo, it was named after the Dynevor family  but given the Welsh spelling of Dinefwr Borough Council instead. 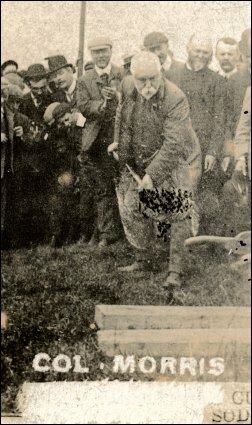 Lieutenant-Colonel Morris cutting the first sod for a municipal project to build a joint water works for Ammanford, Betws and Llandybie. He was the eponymous Colonel of Colonel Road. After a career in the Indian Army, David Morris, born in 1843 in Coedcaebach, Betws, returned home bearing the rank of Lieutenant Colonel. Despite little education, he had gone to the Indian Army as a railway engineer with experience gained on the Swansea to Brecon railway. He went to India in 1866 where he became involved in mining ore in the Punjab between 1886 and 1889. Also while in India he had been responsible for planning one of the first railways built in the sub-continent in 1872. Between 1890 and 1898 and was one of the officers put in charge of the port of Karachi before retiring to his native Betws in 1899. On his return he soon assumed the role of a country gentleman, building a large house, Brynffin, as his residence; becoming a Justice of the Peace; a local councillor; a governor of Aberystwyth University and an active member of Capel Newydd, the recently rebuilt Welsh Methodist Chapel on Betws Road. In 1907 he became chairman of Ammanford Urban District Council, though not the first one as he had hoped. That distinction went to another Lieutenant Colonel, the industrialist William Nathaniel Jones, who was elected the first chairman when the council was created in 1903. It is said that, when the boundaries of Ammanford Urban District Council were being drawn in 1903, Colonel Morris used his infuence to ensure that his home, Brynffin, was placed in Ammanford, not Betws. That way he could be elected to the larger town council of Ammanford and not the smaller village of Betws. Colonel Morris also owned Glan Nant y Ffin farm which was run for him by one Gwilym Myrddin of Cilycwm. After his death in 1913, aged 70, the road he had lived on was named COLONEL ROAD in his memory. Brynffin, is the property and residence of Lieut.-Col. David Morris. The Hon. W. F. Rice [ie the 7th Baron Dynevor, Walter Fitz Uryan Rice  see Rice Road, above], Mrs. Jones of Carregamman, and W. N. Jones esq. J.P. are the principal landowners. His house, Brynffin, became the residence of the parents of Ivor Richard, later to become Baron Richard of Ammanford (see essay in the "People" section of this website). Colonel Morris was the great uncle of Ivor Richard's father and Ivor Richard's grandfather, William Richard, was the chapel minister of Capel Newydd from 1923 to 1936. Colonel Jones used the newly acquired land for heavy industrial development, building Abelash Tinplate Works in 1889 and Ammanford Gas Works. This heavy industry (and, one would guess, dirty and noisy industry as well), caused friction between Colonel Jones and the owners of the nearby Dyffryn Mansion and a lengthy legal battle ensued. In settlement of the dispute Tirydail Tinplate Company bought out the owner of Dyffryn Mansion with Colonel Jones himself taking up residence there in 1892. Norman Road: after his eldest son Charles Norman Jones 1883 - 1928. He emigrated to America in 1906, served in the US Air Force in the First World War and died in Maryland, USA, in 1928 aged 45. Harold Street: after his son William Harold Jones 1886 - 1973. Harold followed in his his father's footsteps to become an auctioneer with offices in Wind Street. He was later appointed Register of Marriages, Births and Deaths for the area. After the family severed connections with Dyffryn House he moved to Llandybie until his death in 1973, aged 87. Florence Road: after his daughter Florence Margaret Jones 1890 - 1976. She married a local barrister who became Clerk of the Peace and Clerk to Carmarthenshire County Council. 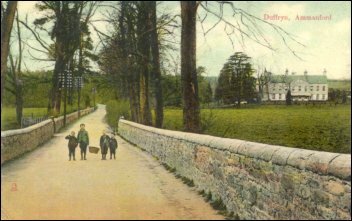 Dyffryn Road in 1916 with Dyffryn House at the right. The house was demolished in 1977 and in 1980 a new council estate was built on the field at the right of the photo. Over the years the estate dwindled in size with various sales and developments. The house itself, unoccupied for years, became vandalized and structurally dangerous and was demolished in 1977. "And Time that gave doth now his gift confound" prophesied William Shakespeare (sonnet 60). That same Time, who had created Dyffryn House in the 1700s, had now consigned it to oblivion in the 1900s. Dinefwr Borough Council bought the 16 acre estate and some adjoining land and in 1980 built a new housing estate there which it named Gwynfryn after a Gwynfryn House, the home of legendary poet and teacher Watcyn Wyn (Watcyn Hezekiah Williams). Watcyn Wyn (1844-1905) was the headmaster of a small school which prepared young men and teenagers for the non-conformist ministry and professions and Gwynfryn had been his home. In 1903 a new Independent Chapel was built across the road from Watcyn Wyn's college and this, too, was named Gwynfryn. After his death the road was named College Street after his college, which lasted from 1880 to 1915. We now travel up the Amman Valley via High Street and Pontamman bridge. But before the bridge was built over the Amman at Pontamman the route was along the modern-day Quay Street, over the river Amman to Betws by means of a ford, along what is now Pentwyn Road to Hopkinstown, and finally meeting the main Neath road at Glynmoch. The route from the end of Pentwyn Road to Glynmoch, and now incorporating Hopkinstown, is now known as Wernoleu Road, taking its name, Wernoleu, from a large country manor and gentleman's residence built in 1872. The original Hopkinstown (Trehopcyn) took its name from the several members of the Hopkins family, farmers in the area, and whose names first appear in the 1861 census. The two bridges over the Amman on this route, Betws bridge and Pontamman bridge, have their own histories. The first Pontamman stone bridge, built 1842, with the railway bridge seen through the arch. Replaced in 1969 with a brand new bridge at a safer angle to the river, the old bridge still stands alongside the new one. The first bridge crossing of the Amman on the Amman Valley and Neath road was a wooden structure in the early 1700s. Then, in the 1800s, the road from Pontamman to Glynmoch became a toll road and the wooden bridge was replaced by a stone bridge shortly after the formation of the Brynamman railway line in 1842, which also needed a railway bridge at this point. The stone bridge, although an elegant structure, was built at right angles to the river. The resulting 'S' bend formed dangerous approaches in either direction, even for the original horse and cart traffic. The increasing motor traffic of the twentieth century, compounded by the fact that there was no pedestrian pavement on the bridge, resulting in numerous deaths over the years and in 1969 a new bridge, built at a straighter angle across the river, replaced the old stone structure. The original stone bridge is still there and is still used by walkers taking a shorter route from Maesquarre Road to High Street. First Betws bridge, built 1892, seen from the Ammanford side with Pentwyn Road, Betws, in the distance. Demolished and rebuilt 1990. Betws bridge is a much more recent arrival on the scene. 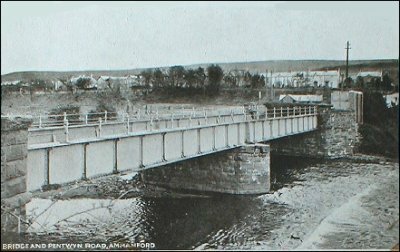 When Cross Inn changed its name in 1880 to Ammanford, the new name  meaning a ford over the Amman  tells us that the only way to cross the Amman to Betws was once by means of a ford. First a rickety footbridge was built to ease travel between Ammanford and Betws and then in 1891 the first steel girder bridge was built. With increasing motor traffic in the twentieth century the bridge became a hazard to pedestrians and a tubular footbridge was built in 1966. By 1988 however, despite attempts to strengthen the bridge to accommodate increasing heavy goods traffic, a 16 ton weight restriction was placed on the structure. Finally the bridge was demolished and the current new bridge opened in 1990. I'n helpu i fynd i'r ochor draw. To help you go to the other side. Jim Griffiths was born in 1890 and the wooden bridge was replaced in 1891 so he obviously had this poem from adults remembering the bridge some time after its demolition. The wooden bridge carried only foot traffic and horse and carts (there were no cars then) would have crossed the river Aman over the ford. This street, running alongside Capel Ebenezer and behind the indoor shopping centre "Shopper's World", to join Quay Street, takes its name from one Doctor Evan Lloyd (described in the 1891 census as "a surgeon and apothecary". His substantial home was The Laurels, on Wind Street, which remained a private residence after the death of the Dr Lloyd in 1924. Then in 1937 the site was acquired by Ammanford Co-operative Society and was converted into their furniture and clothing store. This site is now the location of a small indoor shopping centre called 'Shopper's World', though it was destroyed by fire in 1986 and rebuilt. We'll digress a little on Doctor Stewart and his surgery, as he was a well known and much liked character in the town, still remembered to this day. The history of his practice is also pretty much the recent history of medicine in Ammanford. His first surgery was in a converted shop in the Arcade where he had a practice with Doctor D H Davies. This Arcade site was extremely restricted for size, as were the nearby practices of Dr Gomer Davies and Drs Peter Jones and Iona Jenkins. An agreement was made to merge the three practices and in 1964 the amalgamated surgery was relocated to No 2 Hall Street, specially converted for the purpose (Doctor Stewart had by now retired). The final move of the practice was to the purpose-built surgery in Margaret Street in 1986. Hall Street Surgery may be no more but No 2 Hall Street still stands, after having been converted for use as Hall Street Guest House for a few years. The site of Stewart Drive was originally part of Tirydail Farm and is mentioned on a 1774 map as Cae Bariwns (The field with a stile, though it could also mean Barons' Field, after Baron Dynevor, who owned the field). The site later became a market garden and nursery on Talbot Road, started up by two brothers, Jack and Willie Edwards. They, like their father, were employees of Tirydail Tinplate works and had become unhappy with the working conditions and uncertainty of their employment. In 1902 they acquired the land from the Dynevor Estate (Lord Dynevor also owned the land which became Talbot Road) and set up in business. Their extensive greenhouse complex, growing flowers and vegetables, lasted until the 1960s before it ceased trading. There was another nursery in the Tirydail area, Tirydail Nursery (known locally as Jones Tomatoes after the owner John Jones) with its greenhouses on Tirydail Square. This, too, suffered the same fate, closing in 1963. The Tirydail nursery site was eventually converted in 1974 into a nursing home named Tegfan after the Reverend Tegfan Davies, former minister of Christian Temple (see the essay entitled "Tegfan" in the "People" section of this website). The Edwards nursery was sold to property developers who built the Stewart Drive housing estate in 1973. A bit of a coincidence, really, that the sites of two former nurseries, a couple of hundred yards apart, should each be renamed after a Doctor  the Reverend Tegfan Davies being a Doctor of Divinity. Quay Street has always seemed one of Ammanford's greatest mysteries  where indeed is the "Quay" of the eponymous street. Quays are normally found on docks or on the banks of navigable rivers and canals, but Ammanford is a good ten miles from the nearest sea. Quay Street does, it is true, lead to the river Amman, but the Amman is hardly a major river, emerging from a bog on the Black Mountain just above Cwmllynfell and flowing for just seven miles or so before it enters the Loughor at Pantyffynnon. Nor is the Amman navigable, unless we mean by rubber dinghies. Apart from some spots which are used as swimming pools by children, the river Amman is extremely shallow in all places, usually shallow enough to wade across. Neither can the Loughor be navigated above a point on the Loughor estuary called Pencoed; so why do we have a Quay Street? There is also a Quay Street in Llandeilo, just seven miles north of Ammanford, but the 'Quay' in Llandeilo's Quay Street is thought to be a corruption of the Welsh word 'cae' which means field. This is a possible meaning too for Ammanford's Quay Street. There was a Field Street in Ammanford until 1957 when it was renamed Heol Wallasey (see below). Field Street (Heol Wallasey) is a continuation of the modern Quay Street so the name 'Quay' could possibly also be a corruption of the Welsh 'cae' (field). But there is another possible derivation of Quay Street which does involve an actual 'Quay'. In 1770 one William Fenton of Pantyffynnon presented a petition to Parliament in London seeking permission to build a canal from the Loughor Estuary at a point called 'Pencoed' which was the highest accessible point for ocean going vessels. The destination of the canal was none other than Pantyffynnon Mill at the confluence of the Amman and Loughor rivers. Nothing came of the venture but had it gone ahead there might possibly have been a quayside, at least in Pantyffynnon, on this canal. Below is the entry recorded in the House of Commons Journal for the 10th of February 1770. (The language used, with its somewhat convoluted sentence structure and heavy capitalization was standard for the eighteenth century. The word "culm" is another word for anthracite coal dust). A Petition of William Fenton Esquire, was presented to the House, and read; Setting forth, That the Petitioner is seised of several Veins of Stone, Coal, and Culm, Situate within the Parishes of Llanedy and Llandybye, in the County of Carmarthen, where great Quantities of Coal and Culm might be wrought, as well for Foreign as Home Consumption; and that the River Lougher is only navigable for Vessels of Burden, to a Place called Pencoid, in the said County, which lies at a great Distance from the said Veins of Coal and Culm; and the Carriage of Coal and Culm from the Place where it is raised is at present expensive, tedious, and uncertain; and that a Navigable Cut or Canal is capable of being made, from the said River Lougher, at a Place called Pencoid Lead House, to a Place at, or near, Pantyffynnon Mill for Boats and other Vessels, by means whereof, Coal and Culm will be easier and cheaper conveyed from the said Works; and the Petitioner is willing and desirous to make and maintain such Nàvigation Cut or Canal at his own Expence; And therefore praying, That Leave may be given to bring in a Bill to enable him to make such Cut or Canal as aforesaid, and such Works as may be necessary for the convenient Navigation thereof, under such Regulations, and in such Manner, as to the House shall seem meet. And it is referred to Mr. Rice, Lord Lisburne, &c.: And they are to meet this Afternoon, at Five of the Clock, in the Speaker's Chambers and have Power to send for Persons, Papers, and Records. No record remains of the conclusion of the meeting held "this Afternoon, [10th February 1770] at Five of the Clock". The project appears to have been abandoned. No trace can be found by the Records Office of the House of Lords as to any further details of the meeting, or the route, construction etc., of any proposed canal. It has to be assumed that any such records were destroyed in the great fire of 1834 in which most of the old Houses of Parliament were burnt to the ground. The modern Houses of Parliament familiar to millions of tourists, including 'Big Ben', were only built after 1834 to replace the old buildings. The name given to this street is conspicuous in a town where most street names are either self-explanatory (Station Road, Church Street, High Street, New Road, Old Road, Park Street, etc.) or in Welsh. This small council estate consists of about 30 flats and houses extending from Quay Street and linking up with High Street. This short street has had more names in its equally short history than any other street in Ammanford. Originally called Alexandra Road (possibly after Queen Alexandra, 1844-1925, wife of King Edward VII) it became known as Heol Post (Post Street), after the local postman, John Gould, who lived here around 1897. It next became known as Field Street, as it led to an enclosure on which many local events were held (on July 11th 1914, for example, the Loyal Order of Ancient Shepherds organised a show on the field). On 19th September 1957 the first sod was cut to start a new housing development on land which would result in the street's fourth name of Heol Wallasey. By 1928 Ammanford was still reeling from the seven month long lock-out that had followed the brief nine-day General Strike of 1926. The reduction in wages that was the consequence of defeat cut deep, and the mining areas were hit hard compared to regions which had other industries to sustain them. The townspeople of Ammanford had already suffered a four-month long strike that had crippled the West Wales Anthracite District during the Summer of 1925, and the pit closure programme following these two torrid disputes saw Tirydail and Ammanford No 1 collieries closed for good, so debt from the strike years was compounded by unemployment from the pit closures. An appreciation of the generosity of the people of Wallasey was shown when their mayor, Alderman Albert Wrigley, visited the town in January 1929. Ammanford Urban District Council arranged a civic reception at Christian Temple chapel, where Tegfan was the minister. Alderman Wrigley, a devout Christian himself, was reported to have been deeply moved by the occasion, especially the singing of the choir, and a bond of friendship was truck up between the two towns for many years to come. The Dynevor family, who once owned much of eastern Carmarthenshire, deserve at least a brief mention in the history of Ammanford because of this connection. The modern Dynevor peerage goes back to 1780 when William Talbot, Baron Talbot of Hensol, was created the 1st Baron Dynevor. His daughter and only child Cecil had married George Rice of Llandeilo in 1756 and she became the 2nd Baroness Dynevor on her father's death in 1782. Then, on her own death in 1793, the title finally passed into the Rice family when her son George Talbot Rice became the 3rd Baron. Walter Fitz Uryan Rhys became the 7th Baron Dynevor on the death of his father in 1911. When the 7th Baron Dynevor died in 1956, his son Charles Arthur Uryan succeeded to the title to become the 8th Baron Dynevor. He however died in 1962 (he is buried in Llandyfeisant Church on the Dynevor estate in Llandeilo). The resulting death duties from two deaths in quick succession plunged the estate into crisis. Large parts of land were sold to pay the duties and even the Dynevor Estate's office building on College Street had to close, being sold as a private residence in 1966. Purpose built in 1914, its strong room had eighteen inch thick walls and heavy steel fire-proof doors where plans, deeds, registers and other legal documents and valuables could be stored. This had been the office from which the three generations of the Bishop family had managed Lord Dynevor's extensive land holdings and business transactions. The sale of most of his land to pay death duties meant there was now very little land to be managed or business to transact. The family's ancestral mansion on the estate, Newton House, was sold by the present Lord Dynevor in 1974 and suffered badly, falling into near ruinous disrepair. It was occupied by squatters for many years and was stripped of many of its original features. Mercifully, both the mediaeval castle and Newton House have recently been restored by Cadw and the National Trust who now run the park, its castles and a tea shop. The National Trust acquired the deer park and the outer park at Dinefwr in 1987. Newton House was purchased by the Trust in 1990 having been through several hands since first sold by Lord Dynevor in 1974. The East Drive was acquired in 1992. The generosity of the Heritage Lottery Fund facilitated the purchase of Home Farm and Penparc in 2002. Dinefwr is now 286 hectares in extent. The Dynevors (whose surname is Rhys) claim their descent from the fifteenth century Rhys ap Thomas who had been granted extensive lands throughout west Wales as a reward for raising an army in support of Henry VII in 1485. This included Dinefwr Castle and its estates in modern-day Llandeilo; in the twelfth century west Wales had been ruled from Dinefwr Castle by Lord Rhys (1129 - 1197) and his descendents, whose lands were eventually confiscated by Edward the First in 1277, just before he finally subdued the whole of Wales by 1284. (The history of Lord Rhys and his castle in Llandeilo can be found in the article on Dinefwr Castle in the "Places to Visit" section of this website.) These lands remained in the possession of the Kings of England for 200 years until a Welsh king, Henry Tudor (Henry the Seventh), seized the English throne from Richard the Third in 1485 and granted the lands to Rhys ap Thomas. When Henry Tudor landed at Milford Haven in 1485 and marched his troops towards the English midlands, Rhys ap Thomas had raised an army from Carmarthenshire in his support. After Henry's defeat of King Richard III at Bosworth, Rhys was knighted, later appointed Chamberlain of South Wales among other positions, and granted the castle at Dinefwr as one of his his rewards. "The Dynevor estates were given by Henry the Seventh to Sir Rhys Ab Thomas, and descended with his other possessions to his grandson Rhys Ab Gruffydd, from whom, through an act of the most cruel injustice, they again reverted to the crown, in the reign of Henry the Eighth. Rhys's ancestors had been in the habit of occasionally adding Ab Urien, or Fitz Urien, to their names, in conformity to the general Welsh practice, in order to show their descent [Ab and 'Fitz' both mean 'son of'']. This designation, after being disused for some time, was again adopted, probably in a vain frolic, by young Rhys. The circumstance being reported to the king, and being associated with the immense possessions and unbounded popularity of the family, was construed [by Henry the Eighth] into a design to assert the independence of the principality, and to dissever it from the English government. It was also supposed, without the shadow of proof, that this was part of a concerted plan to depose King Henry, and bring to the English throne James the Fifth of Scotland. To increase the absurdity of the whole business, the plot was said to be founded on an old prophecy, that James of Scotland with the bloody hand, and the Raven, which was Rhys's crest, should conquer England. On such frivolous grounds was this young chieftain, himself one of the first commoners in the realm, and connected by marriage with the family of Howard, arraigned for high treason, found guilty, and beheaded. ......On the accession of Queen Mary, his son, Gruffydd Ab Rhys, had his blood restored, and received back part of the estates; and Charles the First relinquished to Sir Henry Rice all that were at that time of them in the hands of the crown. The estates thus restored to the family were valued at about three hundred pounds a year; these constitute their present Welsh territories, and are all that remain to them of the princely possessions of their ancestors. ......The house of Dynevor has always held considerable influence in the county [ie Carmarthenshire], and has in several instances furnished its parliamentary representatives. George Rice, who died in 1779, married in 1756 Lady Cecil Talbot, only child of William, Earl Talbot. This nobleman was afterwards created Baron Dynevor, with remainder to his daughter, who, on his death in 1782, became Baroness Dynevor. On the death of her mother in 1787, she took the name and arms of De Cardonel, which are still borne by the family. Her ladyship died on the 14th of March 1793, and was succeeded by her eldest son George Talbot Rice, the present Baron Dynevor [in 1815]. Click HERE for a much fuller history of the Dynevors in this website which traces the history of Dinefwr and the Dynevors for a thousand years.